My most memorable career accomplishment is graduating from business school with my MBA at 40 years of age. My most memorable personal accomplishment has been seeing my three daughters finish college and start their professional careers. Most recently, my youngest daughter graduated from MIT with a degree in Chemical Engineering. Of course, I am still on my leadership journey. However, I believe I started on this journey years ago. My father was a Pastor, a Director at a local college and a Retired Army Master Sergeant. He was my first mentor and had a great influence on my leadership path growing up. In college at the University of Georgia, I was in Air Force ROTC and the Emerging Leaders Program. In graduate school at the Simmons College, I studied leadership and worked alongside other women leaders in an all women’s MBA program. In my career, I completed a Leadership Development Program through the Network of Executive Women in 2015. Most recently in 2017, I’ve completed the She Should Run Incubator. I am excited about what the future holds for me in Public Service leadership! Upon finishing the She Should Run Incubator, I had two goals. First, to get more involved in my local political party. I am currently an Independent. As a result, I reached out to both the Republican and Democratic local parties to review their platforms and find ways to get involved. After doing so, I decided that the Democratic Party was more in line with my current political views. So, I signed up to get involved and will be volunteering at the 2017 Massachusetts Democratic Convention. I am so excited to be getting more involved in my local political party! My “aha” moment was when I saw how many women were signed up for the She Should Run Facebook group. At that moment, I realized I was not alone. I had found a community of like-minded women who wanted to run and make a change. That is why I am an incubator member. To be a part of the movement for positive change in this country. For my daughters and all of the daughters out there. I had to step up. It was the time I got off the bench, got in the game and found a place to serve! Note: This interview has been shortened for clarity. 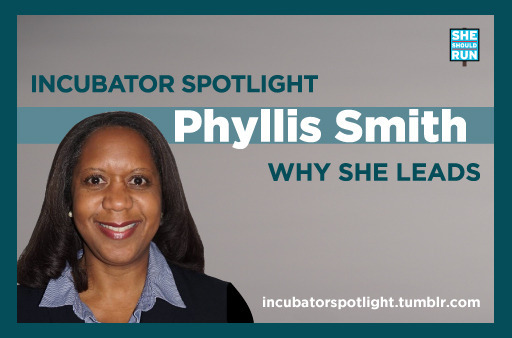 Update: Phyllis was appointed to a local committee and is an official member of the Franklin Cultural Council.